Drowsy and cow-licked, slovenly munching cereal in front of Saturday morning’s cartoon slate. Right before Tales from the Cryptkeeper. Right after ReBoot. In ABC’s 10am slot comes Bump in the Night to slap you awake with the Taz-like “WAOOOHH!” of a giant bogey-looking creature called Mr Bumpy – a green monster with saucer-sized eyes, a purple wart and way too much energy for this early in the morning. Mr Bumpy resides under a child’s bed and mercilessly gobbles up his valuables (read: socks). Mr Bumpy is trouble. The show had a simple premise. 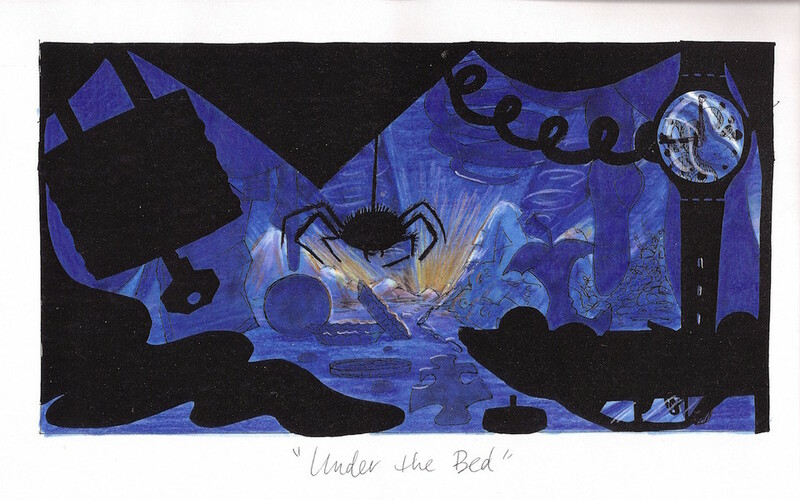 A rotating cast of characters who lived under the bed of “the boy” found themselves in comical situations that they had to help each other out of. Mr Bumpy was the show’s bumbling Amelia Bedelia, causing mischief at every turn, his friends ever ready to cast him a rope to the life raft. An example of a plot is listed by IMDB as: “Bumpy is after a particularly juicy sock. Unfortunately, an ambulatory glove is after the same sock. No way, no how is Bumpy gonna let some glove get his sock.” Straightforward, sure, but it translated to wildly mirthful entertainment. That it managed to captivate its niche viewership ensured its status as a cult hit. As an added bonus, it was one of the first programmes to be distributed as a “kid vid” (a video cassette distributed by the network). The show’s real stock, however, traded in visuals. It was a spectacle, a stop-motion marvel that proffered a sensory buffet. “We wanted a character who was basically just a big expressive face, and after playing around with some designs, came up with Mr Bumpy,” explains series co-creator Ken Pontac. Jennie Trias, then-VP of Children’s Programming at ABC, asked Pontac and boyhood pal (and co-creator) David Bleiman to pitch a stop-motion kids show to boost the Saturday morning bill. For his meeting with Trias, Pontac put together what he calls a “totally clueless pitch book” along with a maquette. The duo had [animator] Josephine Huang sculpt a mock-up of Mr Bumpy with his head tilted back and mouth wide open, about to eat a sock (his default position). Consequently, each character had a calling-card appearance. Mr Bumpy’s BFF, Squishington, resembled a blue puddle and lived in the toilet tank. Molly Coddle – a comfort doll belonging to “the boy’s” sister – could have been a patchwork experiment of Toy Story’s Sid, but what she lacked in a polished appearance, she made up for with heart-melting charm. And the purple-warted, sock-eating antihero also had a vocal register to rival Taz (no surprise, as Bumpy was voiced by the legendary Jim Cummings, who also voiced the Tasmanian Devil and Tigger). Pontac was in the biz long before Mr Bumpy was born. As art director for Gumby Adventures in the 80s, he knew a thing or two about creating a malleable superstar. His business card used to boast a title of “the big cheese”. Once he sold the show off the back of a magnetising maquette, Pontac felt compelled to write to Will Vinton of Vinton studios (the pioneers of Claymation) apologizing for the onslaught of “articles that would be coming out calling our technique ‘Claymation’” and clarifying that Bump employed stop-motion animation. The Vinton Studios’ claim to fame at the time was the clay-mated California Raisins – an unlikely trio of anthropomorphized dried fruit, brought to life by ad execs and the California Raisin Advisory Board through an axe-slaying rendition of I Heard It Through the Grapevine. The minute-long commercial also featured a clay-faced Michael Jackson. It sounds impossible now, but in ’86, the wrinkly supergroup stole the hearts of America and found a home on the Billboard Hot 100. The list of people who weren’t amused was extensive. BS&P, and one network censor in particular, was the fun sponge in the relationship. “Please delete the steam coming from the boiling lobster pot,” they demanded, citing hot steam as an act of interpersonal violence unsuitable for children; “We are evaluating the line: ‘Get bent’ to determine if the expression has a hidden slang meaning that would not be acceptable for Saturday morning broadcast,” they threatened. “Please delete the phrase: ‘You’re so stupid!’ We wish to avoid negative IQ references,” they droned. Intelligently, Bump in the Night nabbed quite a few Nightmare Before Christmas veterans to work on it, some of whom eventually found their way to Pixar. Perhaps Mike Wazowski – the cyclopean, ephebiphobic green monster from Monsters, Inc. – owes Mr Bumpy. Could it be that he stole his look from the star of Bump in the Night? “Maybe,” shrugs Pontac when I ask if he thinks Bumpy is a precursory relative. “Who can say who saw what when and how it stuck in their minds. Mr Bumpy isn’t the first green monster with eyestalks, nor was he the last”. It’s been 20 years since Mr Bumpy first bounded all over the bedroom, thwarting evil in the form of toy robot Destructo and the Closet Monster, a heap of acrid unwashed clothes. He may not be first or last, but often it’s the middle men that leave the biggest impression. “We tried, despite occasional chiding from the network, to tell stories that amused us,” shares Pontac. “The staff was passionate about doing great work and it showed on the screen. Jim Cummings and Rob Paulsen did an amazing job with the voices and Jim Latham’s music was a perfect fit.” The show was something different – a harbinger of bizarre aesthetics and unorthodox clay characterization that married side-splitting gags with gonzo show tunes and exceptional storytelling. Yet what really gives it gravitas is the irrefutable appeal of its visual character: individual, impressionable, and downright visionary.